Steam technology lends itself extremely well for intensive cleaning of persistent or difficult accessible contaminations and numerous other applications in the industry. With decades of experience Wigrex offers an industrial range of electrical and diesel powered steamers and generators with a high steam production for professional use. 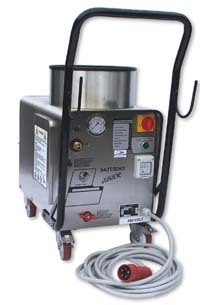 Our low-pressure steamcleaners and steamgenerators stand for quality. The strong stainless steel bodywork, advanced electronic control and other high-grade materials show that these ranges have been designed for the professional and industrial market. Innovative techniques and the power of steam offer numerous applications. Furthermore, steamcleaners consume a minimal amount of water, contradictory to high pressure cleaners that easily make a wet affair. Also, the high steam temperature has a disinfecting effect. Therefore, steam cleaning is often used in the food industry with its strict HACCP norms! The possibilities with steam are endless. An electric boiler produces almost dry, overheated steam. This drysteam can be applied by using different nozzles / systems, with or without the addition of a specific cleansing agent, injection, vacuum or compressed air. Our machines can be adapted to specific demands, such as increased water quantity for extremely wet steam production, an automated water filling system or a integrated compressed air system. Wigrex also provides customized designs! Think about building in steam equipment in a conveyor belt system for belt cleaning, usage in automated systems like robotic arms, special nozzles and lots of other possibilities. Years of experience, quality and clearness have led to the strong position Wigrex has among professional users. We offer the Join Super Steam program for excellent steamcleaners with a high resistance in industrial surroundings. 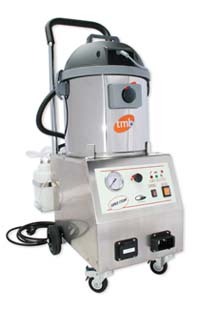 Various 230 V and 400 V steamers can be found in this line, like our restyled 9000 and 18000 Watt machines with a very high steam production and large water reservoirs. The electrical or diesel powered Jet steamer is the extension of our program. By means of very high steam temperatures and a patented integrated compressed air system these steam cleaners match up to high pressure cleaning and are an alternative for dry ice-blasting! The environmentally friendly Wigrex cleaning agents can be used to quickly remove persistent greases, oil, chewing gum, paraffin, lime, moulds, oxidations, sugar remains, chocolate remains, graffiti, stickers, etc. Wigrex has for example a special programme for effective parrafin removal. in depth cleaning of concrete, brick, rubber mats, floor covering, etc. electrical steam generators in the industry for numerous applications , also automatised. carpet cleaning companies in combination with scrubbing machines for the removal of chewing gum, edge filthiness, stains etc.